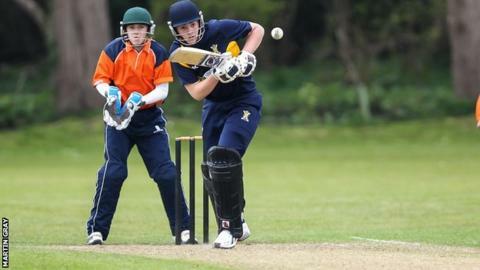 Guernsey youngster Lucas Barker has set his sights on a place in the squad for the ICC World Cricket League next year. The 18-year-old, who made the senior Guernsey side in the summer, travels to Sri Lanka for a 10-day training camp with Sussex Academy on Wednesday. "I want to train hard and hopefully I'll get picked to go to Malaysia with the senior squad in February," he told BBC Guernsey. "I'd love to take it as far as I can. I love cricket, it's all I've ever done." Guernsey are in Division Five of the ICC World Cricket League and are up against Channel Islands rivals Jersey, as well as Nigeria, the Cayman Islands, Tanzania and hosts Malaysia. Barker's trip to Colombo is focused on developing batsmen's technique against spin bowling, and he said he was relishing the chance to improve his skills. "It's a great opportunity - 10 days over in Sri Lanka and it's just bat, bat and bat," he said. "I've looked forward to it for months. I got told about it at the end of the summer and if I'm honest it's all I've thought about. "At the end of [next] summer I'll hopefully be able to say that I've trained as hard as I can and if that means other opportunities arise then that would be fantastic."